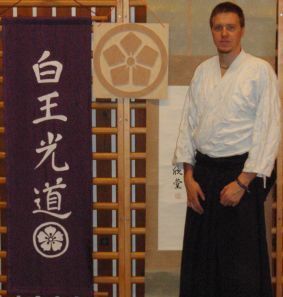 Patrick Wagner-Draxler started his way in traditional Budo 1995 in Aikido (after his experiences in Judo, Karate and Tae Kwon Do), on the search for it’s origins he met 1999 on a seminar in Pinkafeld Shihan Johnny Lenskens and his Hakko Ryu. He loved the similarties of these two martial arts and met there also Rudolf Gräf Sensei . He became his pupil and accompanied his teacher often to seminars to Belgium to be thought by Soke and Shihans the arts of Kokodo Ju Jutsu. As highest ranked pupil he also supports the teachers of the Makoto Dojo at the trainings.